Disney’s newest movie, “A Christmas Carol”, is an interesting take on Charles Dickens’ most famous story with the same name. Throughout the years there has been many remakes of this wonderful book, from “Mickey’s Christmas Carol” to Bill Murray’s “Scrooged“. This time, Disney tries its hand at making the story come alive in 3-D.
“A Christmas Carol” is one of my favorite childhood stories. I found Ebenezer Scrooge a fascinating character, a grumpy, greedy, cratchety old man who refused to let go of one cent of his earnings. Every one familiar with “A Christmas Carol” will be familiar with the story line told here, with a few strange changes made by Disney. I was interested to see how Robert Zemeckis would decide how the Ghosts would look like or act like, and after viewing, I can’t say I enjoyed having Jim Carrey act in the roles of all the Ghosts. All I could see was “Jim Carrey” in the Ghost of Christmas Past and Present. As the Ghost of Christmas Past, his plastic, almost rubbery facial movements as a brightly lit candle overwhelmed me, as the facial movements were ones we’ve become much too familiar with from his various comedies such as “Liar Liar“, and “The Mask“. It brought me out of the movie viewing experience, much as the incessant laughter and grins did with the Ghost of Christmas Present. Perhaps if these characters were not so annoyingly mapped with Jim Carrey’s face, I would have enjoyed the Ghosts more and been able to move past the fact that it was Jim Carrey acting in these roles. The continuous laughter I could have done without, and if I had been Ebenezer Scrooge at that moment, I probably would have stuffed his scarf/robe down the Ghost of Christmas Pasts’ throat and asked what he thought was so funny. Visually, the movie is very beautiful, but I felt that with all the effort spent on the 3-D effects and the facial mapping, that the soul of the message was missing. With so many various creative re-telling movies of Charles’ Dickens story, I feel that the newest movie is a failure. I enjoyed it to some extent, but the annoyances I mentioned above took away from being able to truly immerse myself into the story. 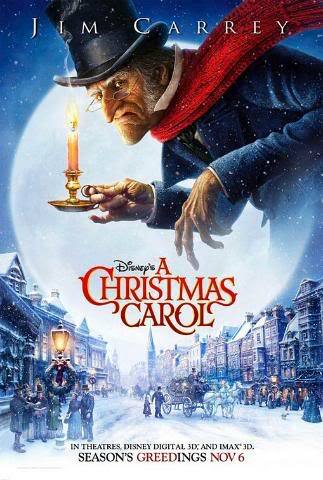 The only time I was able to sit back and truly enjoy the movie was at the very beginning and at the very end of the movie, when Scrooge was really being a ‘scrooge’ and when Scrooge realized that if he didn’t change, he and other people around him would be miserable. They were the only moments where you could see the character development of Ebenezer Scrooge, so the transformation was truly enjoyable. ‘A Christmas Carol’ is definitely NOT a kids movie. I would not expect kids to enjoy this film with their parents, especially young kids. It contained far too many scary scenes, starting with the visit of Bob Marley, to the revelation that Scrooge is the one buried in the grave. The most disturbing scene was the transition from the Ghost of Christmas Present to Ghost of Christmas Future, a scene that was kind of creepy to me, and would no doubt bother someone much younger. The voice acting was terrific, as they usually are in such large scale animation films from production companies such as Disney, so that was to be expected. The animation was absolutely amazing — but don’t expect to get much more from this movie that you could have gotten from watching a more enjoyable “Scrooged“. It will be easily forgotten seconds after you leave the theatre, as there are no truly memorable or touching moments. Unfortunately there is currently no decent Christmas movie playing right now, so if you choose to hit the theatre to watch a holiday movie, this will be your only choice. Astroboy is the better kids movie, and the other movies coming out this week “Men Who Stare At Goats” are better offerings than this movie or “The Box”. If you want awesome visual effects however, this movie is it. On the fence, but wait for the rental. Not worth it, even in 3D. 2 turkeys / 5 turkeys. Wait the Trailer via Youtube!